Websites aren’t just reserved for brands and creative professionals. A branded website or landing page can be a great tool for job seekers of all levels and industries. In certain industries like design, specific areas of advertising and marketing, writing, and fine arts, the personal portfolio or website has always been a key component of one’s professional marketing portfolio. 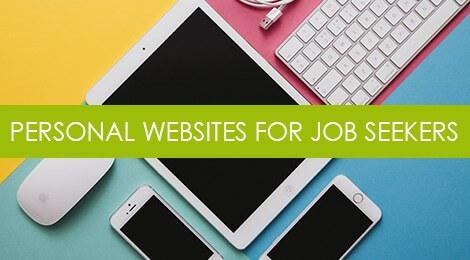 But job seekers in other fields can benefit from having a basic website to complement their resume, LinkedIn, and cover letter, and using it as a platform to expand upon the content in those documents. Bonus: they’re pretty easy to create these days. A website can include things that don’t quite fit into the standard resume format – such as outside projects or unrelated skill sets. But it can also be a platform for providing more context on things that matter heavily to hiring managers, and for which the resume provides limited space to highlight. These might include related freelance or volunteer work, additional training, earlier experience, or even personal interests that you want to use as a bridge into a different area of focus. Like LinkedIn, a website increases your visibility, making it easier for hiring managers to find you online and get a broader picture of your experience and qualifications. It’s an extra tool to help you stand out in a competitive, digitally-driven job market. A web presence can help you articulate and market your personal brand – and appeal to the culture fit. In addition to the information on your resume, there’s a personal component that factors into your personal brand, and the value you can bring to an employer. And while you may be limited as to what personal attributes you can discuss on a resume, LinkedIn, or cover letter, a personal website gives you more flexibility to discuss yourself as a person – and that can be an important part of an organization’s culture fit. A website can simplify complex ideas and show (instead of tell) your accomplishments. Resumes are famous for jargon, and even the best ones can still lack that complete picture that often is easier to describe in your individual voice – through more relaxed language, visuals, and samples of your work. It provides a better platform for telling your story – particularly if you’re changing careers. A cover letter is a great place to make the connection between what’s on your resume and why you’re interested in a particular company, industry, or role. But with certain constraints on space, format, and content, it’s hard to tell a full story. A personal website gives you a broader, more flexible platform to really educate your audience on who you are, what you’ve done, why it’s relevant to the new field you’re pursuing, and how you can bring value. Negative search results will be less visible by creating a public profile that organically shows up higher in the search results list when someone searches your name online. What Information Belongs on a Personal Website? The very bare bones of a solid personal website should include 4 things – an introductory homepage, an “About Me” page with a thoughtfully written (and professional) bio, a page that includes your resume (preferably with a link to download a PDF copy), and a contact page with your details and links to other relevant profiles (like LinkedIn). A blog can be a good space to share content and position yourself as someone who’s knowledgeable and actively involved in the industry. This can add extra value to someone who is changing careers, lacks experience in a particular industry, but wants to showcase their knowledge and interest in the field. Side projects, freelance work, and personal work could also be included if they add value in some way – i.e. demonstrating a certain software proficiency, a knack for design, or strategic thinking. Fine art and writing can fall into this category as well if you want to show more of your personality – but only if the content is appropriate for hiring managers to review. The good news is that there are so many services and tools available now – like Squarespace or Wix – that make the process of creating online profiles and basic websites extremely user-friendly. About.me is another great option for a basic static landing page where you can build out a detailed bio and include links to relevant social media sites and profiles. A well-executed website is thoughtful in its approach to marketing, content, and design, and can round out your personal brand portfolio with a professional and polished edge. And, much like your resume and other materials, it should also tell a unique story around your personal and professional accomplishments. Do you need help crafting an impactful digital brand presence? Check out our portfolio of professional design services to help you create fresh, creative, and professional websites, infographics, logos, and business cards to complement your resume and other job search marketing materials. Tags: career change, personal branding. Bookmark the permalink.